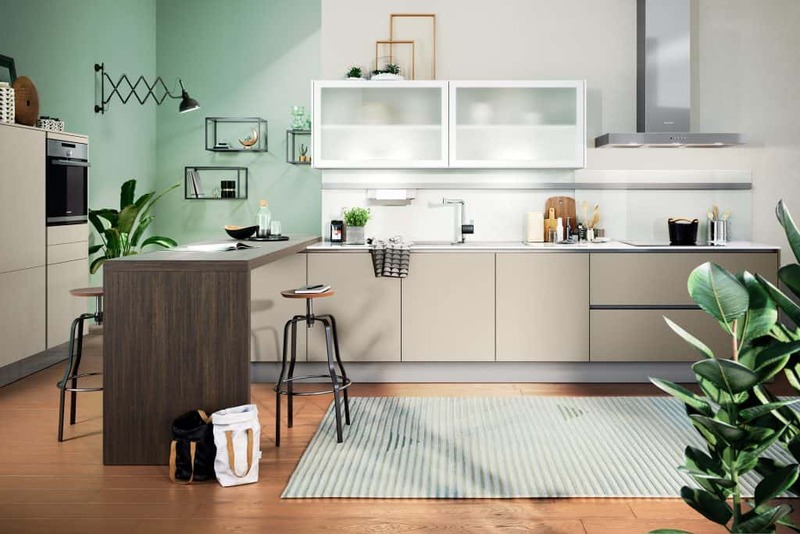 We offer a stunning range of German kitchens available in a contemporary handleless design, a flat door design with handles, or a shaker style door with handles. 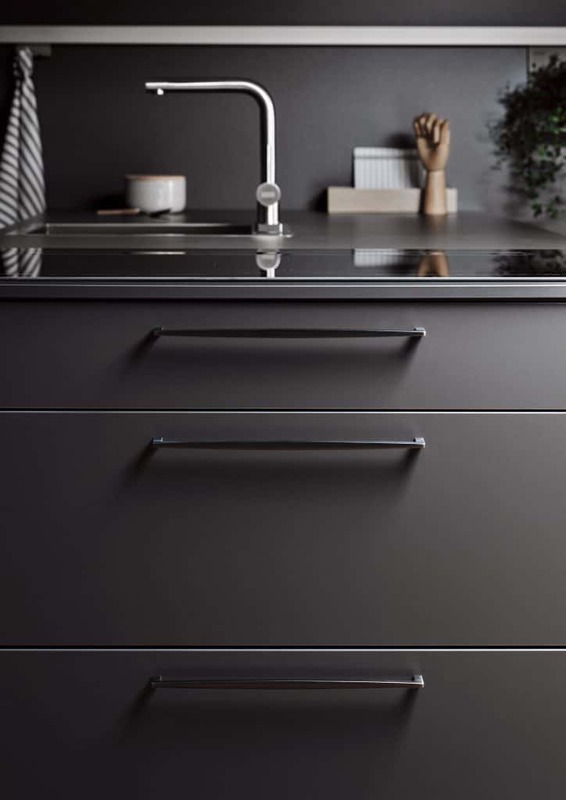 Available in a wide range of different colours and finishes such as matt, gloss and lacquer, we can create your ideal kitchen to suit your style. 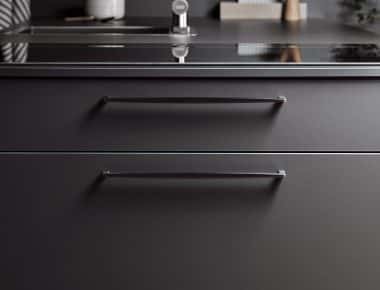 Handleless – rebated from the carcase, a stainless steel C shaped channel is inserted giving your kitchen a clean timeless look which is easy to clean. Shaker style – this is a traditional style, Shaker style doors are a framed and panelled door with a flat centre panel and raised (usually squared) edges. Handles – this style of door is a flat smooth finish with the addition of a handle. 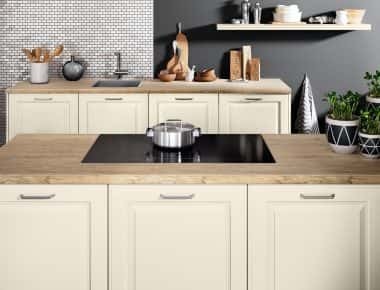 Traditional – a UK based company creating kitchens from solid wood, and can be painted to suit any colour scheme or style you are looking to achieve, with options for different levels of detail on the units and finishing touches to suit you. The possibilities with this design are endless, so any space can be beautifully transformed just the way you want it. Handmade Bespoke Kitchen – made to measure units making the most of your space in your kitchen. These include a wide range of colours and finishes. Our cabinets come in numerous heights and widths so you can be sure that your kitchen units fit even in the most challenging spaces. New Kitchens use high quality furniture with soft close drawers, space optimising designs and interior solutions. Select the tabs below to read more information about our kitchen ranges. 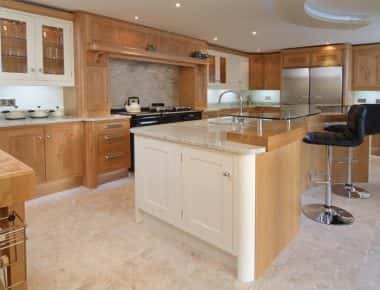 Custom kitchens, handmade to your individual specifications, are realised via expert craftsmen at the Traditional Furniture Company, by using traditional techniques to construct bespoke kitchens of industry leading quality. To define bespoke in terms of traditional kitchens, wood is sourced from prime locations across the globe and is then converted into expertly crafted kitchen components by a talented workforce of carpenters, producing products that add class to your kitchen. Layouts of all tastes can be created, therefore your traditional bespoke kitchen can be made as rustic or contemporary as desired. Offering an array of design styles & colours to provide you with maximum choice. High quality unique kitchens in addition to handmade freestanding kitchen elements are expertly crafted from a combined team of experienced carpenters, joiners & fitters. Traditional handmade furniture is crafted using the finest materials and being a custom tailored kitchen, the possibilites are limited only by your imagination. The production methods behind traditional kitchen construction are reinforced with the latest developments in design technology, giving you the ability to create your perfect envisaged kitchen. From a minimalistic and modern kitchen to an ornate and elegant kitchen, here at New Kitchens your ideal kitchen can be designed. Choose from American Oak, European Oak, Pippy Oak, Cherry, Maple, Walnut or hand painted for your traditional ‘door in frame’ kitchen. 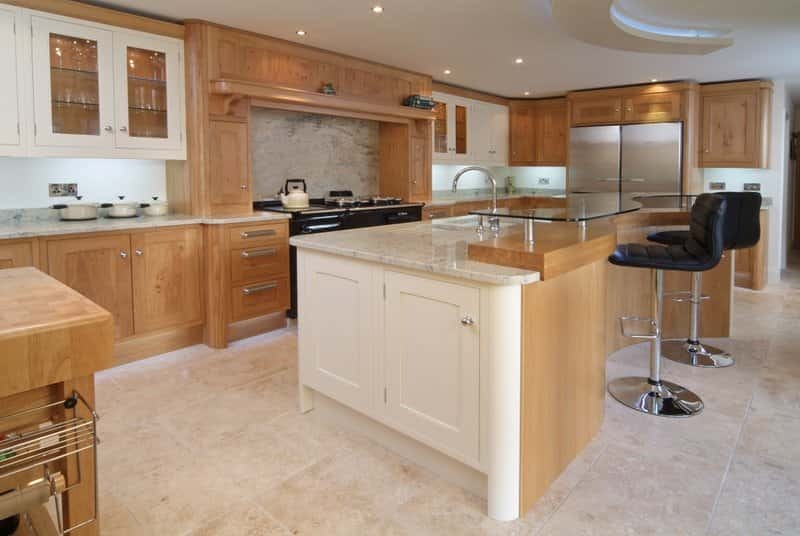 Get in touch with us here at New Kitchens Ltd today for any queries you may have regarding traditional bespoke kitchen installation in Hertfordshire & Bedfordshire. 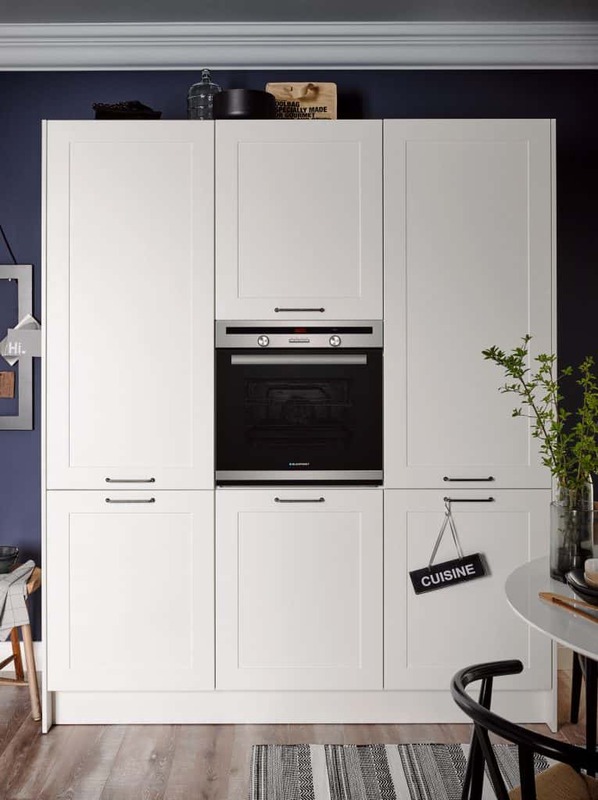 The traditional German kitchen style includes panelled doors which are available in a variety of styles and colours. The kitchen you select is carefully constructed in Germany, according to your personal specifications. 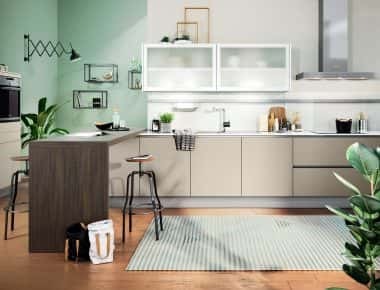 With experienced kitchen installation and design teams, their vast knowledge accrued through a long-term working partnership with the German manufacturer, advising you on each aspect of your ideal kitchen. Combining all these factors, every kitchen is uniquely designed and crafted to specific sizing parameters, resulting in a tailored kitchen lasting for years to come. The kitchen you select is carefully constructed in Germany, according to your personal specifications. 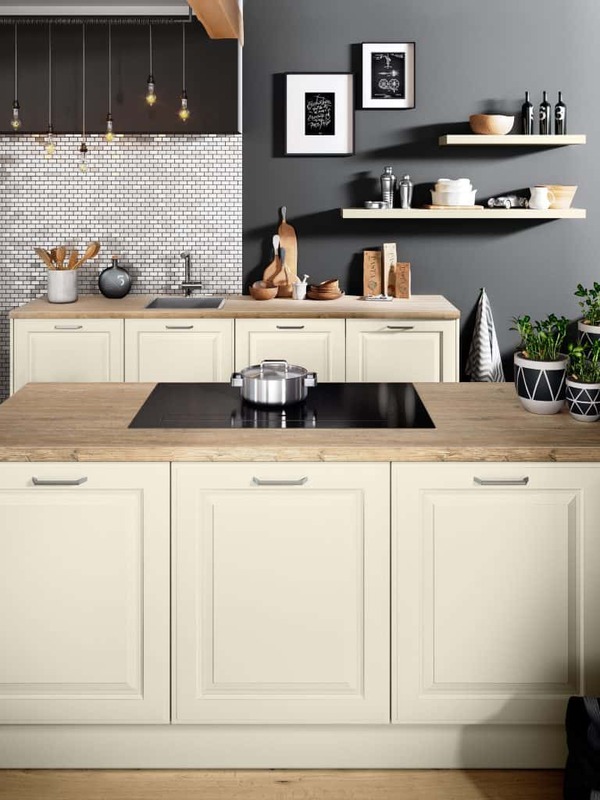 With experienced kitchen installation and design teams, their vast knowledge accrued through a long-term working partnership with the German manufacturer, advising you on each aspect of your ideal kitchen. 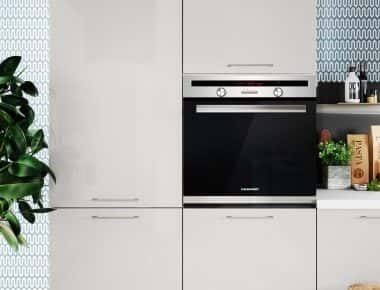 Any modern kitchen from our German kitchen manufacturer is known for its worldwide reputation of durability, design choice and outstanding quality; emerging from German sourced engineering. 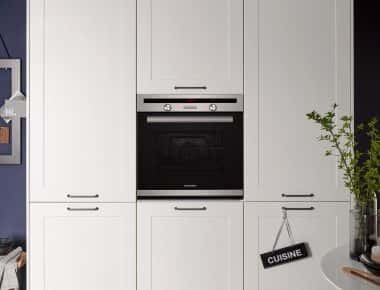 The German made kitchens guarantee each unit is solidly constructed, with soft closing fronts and some of the smoothest bearings currently available in the kitchen industry. All cabinets being precisely engineered to the highest quality. Combining all these factors, every kitchen is uniquely designed and crafted to specific sizing parameters, resulting in a tailored kitchen lasting for years to come. Handles – a modern flat door mixed with the traditional feature of a handle. New kitchens has a large selection of handles and flat doors in a range of colours to make your kitchen unique. Handleless – The kitchen is the heart of any home, handleless kitchens are durable, easy to clean, and extremely practical. They are available in different finishes whether you like a striking high gloss or an elegant matt finish. Handleless kitchens are a relatively new kitchen design, but they are growing rapidly in popularity. They provide an effect which is visually sleek and minimalistic, perfect if you’re looking for a kitchen design which stands out from the crowd. New Kitchens Ltd can provide stunning handleless kitchens throughout Hertfordshire and Bedfordshire. Creating handleless kitchens requires more than just selecting some handleless kitchen cupboards; it’s important for the entire room to have that modern, sleek feel. From the lighting down to the flooring, we can help put together a design which really embraces the essence of minimalism, with clean, simple lines and beautiful finishes. 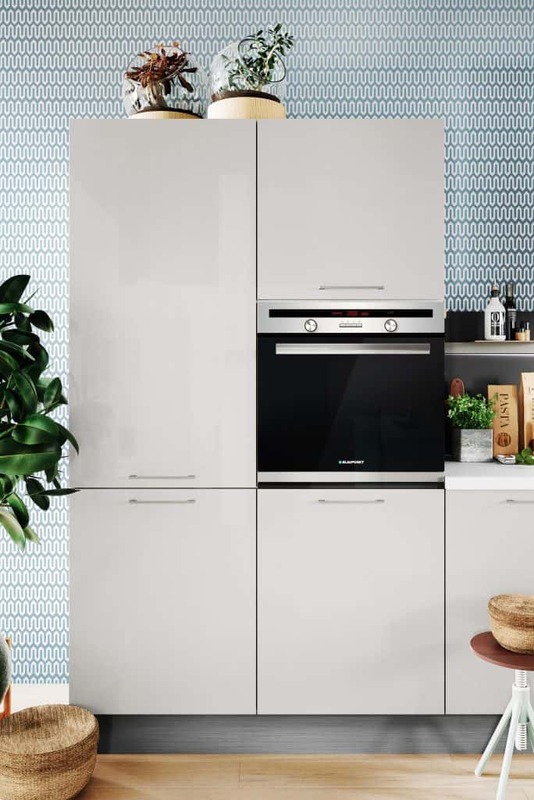 Get in touch with us here at New Kitchens Ltd today for any queries you may have regarding modern kitchen installation in Hertfordshire & Bedfordshire.